We'll visit Paris next Saturday, and there'll be a meteor peak during the night. Are there any camping areas where the sky will be dark and away from light pollution? It doesn't necessarily have to be a camping facility, but a place where we can spend the night. We'll be traveling by car and we can go up to 2 hours away from city center. I have no actual experience stargazing in France, but nobody answered, so I'll try. 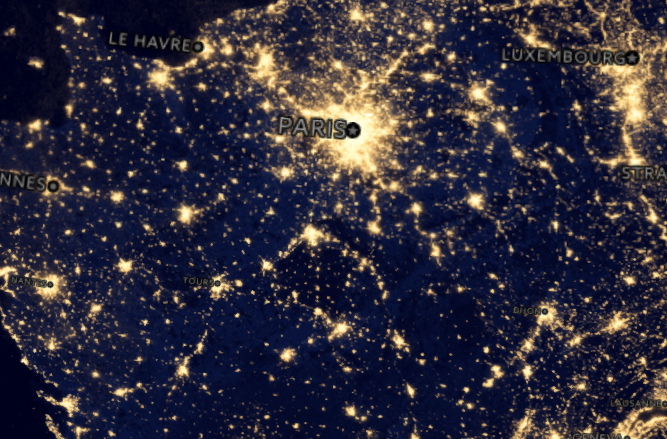 The dark areas have minimal light polution, and a relatively dark area is seen south of Paris. By looking at Google Maps, this seems like the area between Orléans and Vierzon, on either side of the A71 road. According to about-france.com this area is called La Sologne, and is popular with hunters, nature-lovers and hikers. According to Google Maps, driving time from Paris to the area is about 1:45 hours. Of course, you'll need to find a good spot in there - away from lights and without trees blocking the view, and where spending the night is possible and legal. Good luck. Not the answer you're looking for? Browse other questions tagged paris camping space or ask your own question. Where to print science posters in Paris? Where to find dacquoise in Paris?